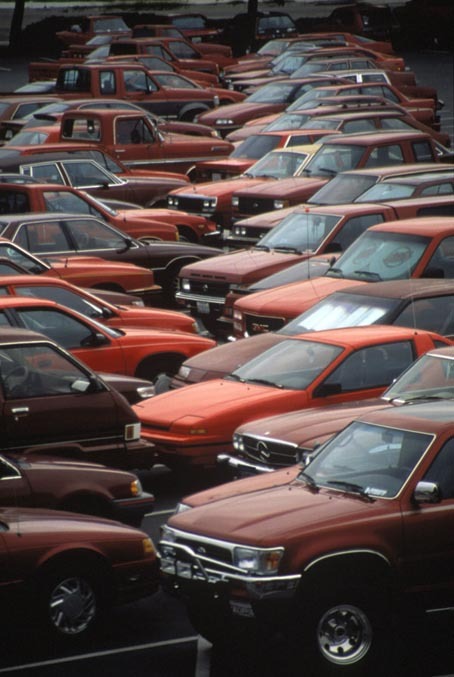 On August 31, 1994 from 6am to noon, at Southwestern College’s parking lots (San Diego), a team of 50 professional and volunteer parking attendants directed the arriving cars to predetermined lots according to car color. Each of the fourteen lots was filled with cars of a different color: dark blue, blue, light metallic blue, silver & gray, black, beige, brown, metallic raspberry, yellow, electric blue, white, aqua, green and red. By Nina Katchadourian, Steven Matheson and Mark Tribe.